Sixteen-year-old schoolgirl Beth Webster is fascinated by tales of noble Savages, despite the hatred her father holds for Indians. When her wealthy mother dies, her father arranges for her to travel from New York to Utah Territory to join him at Camp Floyd. For Beth, the journey represents an adventure she cannot refuse. Yet she dreads the thought of living with a cold, stiff father she barely knows. Snake Indian Sparrow Hawk accepts the Army assignment to scout for the expedition in order to help feed his people, but the moment he lays eyes on the young honey-haired girl he must protect along the way, his heart is lost. He knows he must ignore his attraction to the white girl, but her free, independent spirit and open heart call to him. Especially when she makes it plain she has no desire to resist him. Can a young couple of such different cultures come together in love and peace, or will Beth’s father’s bigotry tear them apart? The war cry echoed eerily over the plain, terrifying enough to curdle the blood in a man’s veins. Or a woman’s. Beth wanted nothing more than to burrow into the ground like a rabbit and pray for safety. Her pulse pounded in her temples and she feared the fright would stop her heart. But fear for Hawk, Miss Hightower and the others drove her to act. “Come on, Francie. Yell,” she cried, standing. They screamed for all they were worth, waving and bouncing on their heels. Their arms entangled them in the willows and they moved out into the open. The night became rife with noise. Piercing cries of “Yi, yi, yi” Beth assumed were the Pawnee. Shouts and screams of pain came from the dragoons. Would the battle never end? Who had been hurt or killed? Please keep Sparrow Hawk safe. Her prayer shocked her. Yet he had been kind to her this night. He had protected her. Because Mr. Stewart asked him to or because, in spite of being Indian, he was a good man? She wished she knew. A horse crashed through the willows. Beth dropped to her knees and yelled for Francine to hide. The boom of gunfire close by all but deafened her. The horse continued to thrash about in the shrubbery. Beth’s heart lodged in her throat. She raised up to look for her friend and saw a hideously painted warrior on the horse aiming a gun at Francine who lay in the grass. The horse bolted and she almost fell. The Indian was gone. Dropping the stick, Beth turned to Francine and instantly became aware of a new set of thundering hooves bearing down on her, this time from a different direction. Why had they left their hiding place? They were going to be killed. A brown arm marked with slashes of red paint snaked around her waist. Her feet left the ground. She hung at the side of the horse, the Indian’s arm holding her in place. In her dangling position, she could not see her captor. She struggled to free herself, digging her fingernails into the man’s arm. Instead of dropping her, he began to draw her up onto his lap. From out of nowhere, strong brown hands latched onto her and she was torn from the Indian’s grasp, falling to the ground. Nearby two men rolled over the earth, grunting, and pounding at each other. Hands pressed over her mouth, Beth watched in horror until Francine cried out for her again. Scooting backwards on her bottom, Beth found her friend and cuddled next to her. Beth recognized Hawk then. He had freed her from the Pawnee and now fought for his life. For hers and Francine’s life. A sudden quiet fell on the small, trampled clearing in the trees where the girls waited, breaths held. One man lay still. The other slowly rolled off of him and lay on his back panting. The Pawnee? Or Sparrow Hawk? Charlene Raddon’s first serious attempt at writing fiction came in 1980 when a vivid dream drove her to drag out a typewriter and begin writing. She’s been writing ever since. Because of a love for romance novels and the Wild West, her primary genre is historical romance. At present, she has five books originally published in paperback by Kensington Books. More recently these were published as e-Books by Tirgearr Publishing. Taming Jenna and Tender Touch are also available in print from Tirgearr. Charlene also designs book covers and other graphic materials for authors at her site, http://cover-ops.blogspot.com. 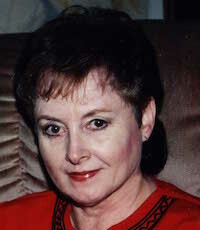 Her latest historical romance is Dances in Moonlight, which she is self-publishing and plans to release in November 2015. Anyone who signs up for Charlene’s newsletter on her website will be eligible for a drawing for a new Kindle. Or they can have their name added by leaving their email address and name in a comment on this blog post. **SPECIAL GIVEAWAY**: Charlene has a giveaway for one of her Karen’s Killer Book Bench blog readers! Leave a comment below for a chance to win an e-copy of DANCES IN MOONLIGHT by CHARLENE RADDON. Don’t miss the chance to read these stories! Thanks, Charlene, for sharing your story with us!! Wonderful extract! I’ve been a fan of Charlene Raddon since her first book. I can’t wait to read the full story of Dances in Moonlight. Sounds like a great book Charlene, best of luck with your writing! Good morning, Charlene, and welcome back to Karen’s Killer Book Bench. Many people don’t know that we’ve been friends forever. I love your books. 🙂 Thanks for stopping by to share with my readers! This book sounds so exciting! I can’t wait to read it! Good blog! Your newest release, like all your books, sounds great, Char. Wishing you oodles of success on Dances In Moonlight and all future writing endeavors. Well-deserved. Thank you everyone. Always rewarding to hear compliments on your work. I don’t particularly like to read, but after reading the excerpt, I’ve got to read the book! It sounds really great! Reads even better than the first time! Wonderful characters and setting! After reading the excerpt I can’t wait To read the book! Great blog, I am always looking for new to me authors. Thanks, Julie. 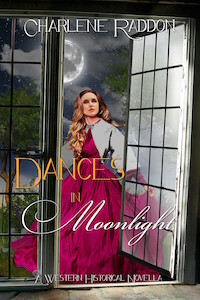 Check out my webpage, http://charleneraddon.com and sign up for new newsletter to learn when Dances In Moonlight will be out. And maybe win a new Kindle. Wonderful excerpt, Charlene. Sounds like my ‘cup of tea.’ I love stories about the old west and especially Indian tribes. I tend to favor the Lakota when I write, but I can’t wait to read about your Pawneee. Sounds like a wonderful read 🙂 I enjoyed the excerpt and look forward to reading the rest of the book.